This amp promises to be many things and barely delivers where things count the most - sound. I wouldn't recommend this amp to anyone, especially considering competing options in this price bracket. When I was a youngster starting to play guitar, I remember an old timer telling me to "beware the industry hype". This was one of the aging hippies, with an aged Strat and a Fender Bassman, both "old school grandpa" gear as far as I thought at the time. Years go by and after changing and purchasing quite a few products that said one thing and delivered another, I remember the advice of my aging hippie friend. In retrospect, it looks like my friend was sitting quietly on a few grand of gear at the time, which was definitely giving him a cause to smile. With that in mind, I recently ran into an amplifier that was so blatantly hyped up, that if you were to pick one up you'd either die laughing or bust a gasket and demand your money back, immediately! The amp I am referring to is the Line 6 Spider IV 15. This is a solid state 15 watt combo amp. According to Line 6 this amp has a "bright and distinctive American clean tone, and then opens gradually to achieve the vintage grit and chime of classic British amplifiers. Experience the infamous "Brown" sound distortion, which is based on a '68 Marshall Plexi 100 with a Variac and jumped input channels, and a searing high-gain tone based on a Mesa Boogie Dual Rectifier." . The amp has 4 channels (Clean, Crunch, Metal, Insane) that can be accessed from the front by a push switch and each channel can store 4 user amp settings. The amp has rotary control pots for Drive, Bass, Mid, Treble, Chan Vol, Tuner / Tap Echo switch, rotary control for effects (Chorus, Flanger, Phaser, Tremolo) and another one for Echo/Reverb. It also has a 1/4-inch input; 1/4-inch headphone/direct output; 1/8-inch CD/MP3 input; FBV jack. The 1x8 speaker is rated at 15 watts. According to Line 6 the amp can save and load presets which could be done via a PC from their website and community. 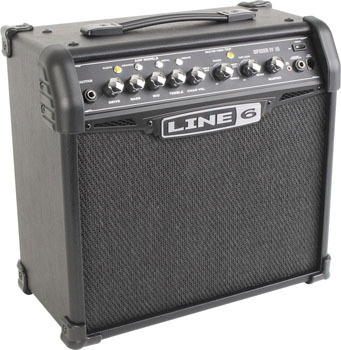 Considering the marketing pitch by Line 6 and the amp's available options at this price, this seemed like a really cool practice amp that could also do some small pub shows. A friend of mine who is an accomplished musician and I decided to put it through the paces by doing an impromptu rehearsal. The style of music that we play involves clean, semi-distorted (crunch) tones as well as some over the top metal and shred sounds, so the 4 channel amp seemed quite reasonable to be at ease in each one of these categories. I had a Music Man Steve Morse guitar with me that day and he was playing a high end Ibanez. Both guitars' pickups are not over the top, so they usually need a little help from an overdrive for extreme metal sounds. We started from clean - there was no clean to be found. The tone was jangly and slightly distorted. By adding some of the fx such as chorus, things got a little more bearable but still this didn't produce any desired results. No matter how much we tweaked and tried, each of us could only classify the tone as "barely passable". On to "Crunch". This is probably where the amp delivers its best tones, but again - I wouldn't call it anything but decent. The crunch was more present and warm, yet still retained a bit of a harsh digital buzz that couldn't quite be dialed out. The metal settings were fuzzed out scooped digital mess, basically sounding like a radio on the fritz. It was bearable at lower gain settings but adding gain started to fuzz it out like a bad old radio. Not a metal sound that I'd be after for sure! One thing that was apparent during this test was the cheap build quality. At $99 I wouldn't expect wonders but the knobs felt too flimsy even at that price range. The Insane setting is even more over the top and digitally grating. Another useless channel as far as we are concerned. With all these channels being a let down we decided to give some pedals a shot - hopefully they'd fix things. I had my AMT DT-2 distortion pedal with me and this usually gives me good results in anything I plug in since it has so many options. We tried on this amp - no dice. The modelling preamp section of the Spider IV prevents the user from doing anything useful with a distortion or overdrive effect in front, it basically piled on another layer of woolly fuzzed out mess. We weren't kidding ourselves - this amp was definitely overhyped. The press agent that wrote the release and the superlatives should be fired, or worse still - made to play this amp until her/his ears fall out. Maybe there was a way to try the 1/8 CD player input by bypassing the preamp section but at this point we were too tired to even bother.